Memoto, a lapel camera to capture your full day at the rate of a snap every 30 secs! 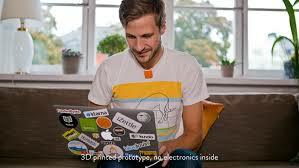 “We want to provide people with a perfect photographic memory,” this are the words of Martin Källström, CEO of Memoto. He has launched a device which is wee but does a hell lot of work. Memoto, designed by his startup, clicks a photograph every 30 seconds till you tell it to stop. It goes on capturing whatever you are looking at, and then applies algorithms to the resulting mountain of images to find the most interesting image. Why I said wee, because the device measures only 36 by 36 by 9 millimeters, is fully made of plastic and has a 5MP camera onboard. The camera which was actually designed for a mobile phone has been customized to work with the device which also has ARM 9 processor running on Linux. It is Linux which makes the device wake up two times every minute, capture a image along with GPS sensor, accelerometer and magnetometer. And when the snapping work is done, Linux puts it back to sleep. This is how it will work at end of the day. After the days pictured have been captured on Memoto, user can plug the camera into his computer and download the pictures. Not only this, those subscribing to the company's cloud storage service can keep their images safe for a lifetime as memory. Martin adds that Memoto has been designed in such way that it stops capturing photos once it has been taken off and placed on either a flat surface, or in a dark place (like one's pocket). I can think of only one thing. Life is sure going to be easy now for the sting news operators with Memoto around. Do visit the developers website here and give your comment on the same.